Retirez les tiges et les fils des cosses de petits pois, nettoyez les cosses. Dans une grande cocotte (les cosses prennent beaucoup de place! ), faites chauffer l’huile d’olive et ajoutez l’oignon. Faites fondre quelques minutes, puis ajoutez l’ail. Faites revenir une minute de plus. 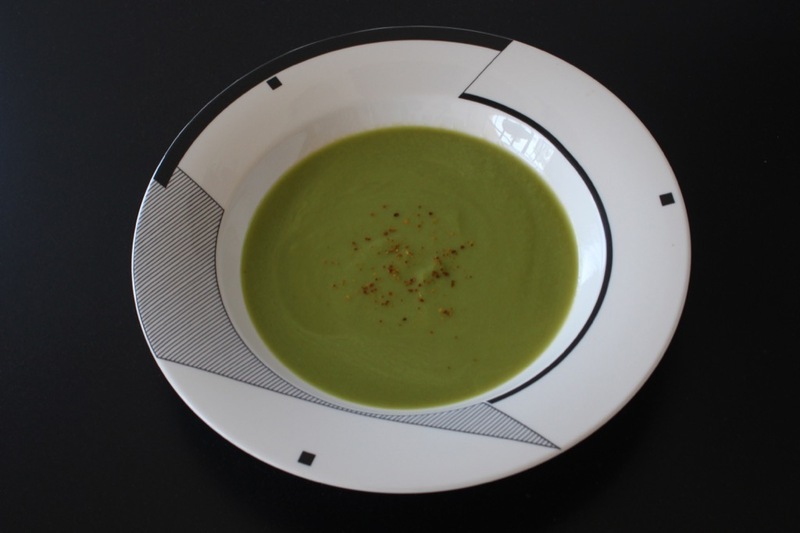 Ajoutez les cosses de petits pois, salez (pas trop, car vous allez ensuite ajouter le bouillon) et faites cuire quelques minutes en remuant. Déglacez avec un peu de vin blanc, laissez cuire encore 1-2 minutes avant d’ajouter le bouillon chaud, amenez à ébullition, baissez le feu et couvrez, et laissez cuire une demi heure (il faut bien entendu faire cuire jusqu’à ce que les cosses soient tendres). Laissez refroidir un peu, puis passez la soupe au mixeur plongeant (ou au blender). Vous n’arriverez pas à faire disparaître les fibres et fils, c’est normal! Il vous faut maintenant sortir votre accessoire magique, le moulin à légumes de votre grand-mère. Impeccable pour retirer les fibres indésirables! Servez chaud avec une pincée de piment d’Espelette dans chaque assiette. I come from Burgundy in France. A small village in the countryside, where kids were told to finish their plates and not throw away food (my grand-parents’ generation lived through WWII, and not wasting anything was still very ingrained in my education). Remove the stems and hard threads of the pods, rinse the pods. In a large pot (pods take a lot of space! ), heat the olive oil and add the onion. Cook the onion for a few minutes, until softened, then add the garlic. Cook one more minute . Add the pea pods, and cook for a few minutes, stirring. Deglaze with white wine, let cook another 1-2 minutes before adding the hot chicken stock, bring to a boil, lower the heat, and simmer covered for half an hour (until pods are soft). Let the preparation cool down a bit, then mix the soup with an immersion blender (or in a blender). You will not manage to remove completely fibers and threads, it is normal! Now comes the time to take out your magic accessory: your Grand-Ma’s food mill . The perfect accessory to remove the unwanted fibers! Place the mill on top of a salad bowl to strain the soup and retain the liquid cleared of fibers. Add a pinch of nutmeg and pepper to your taste. Sprinkle a pinch of Espelette pepper in every plate and serve hot.